Many readers and playgoers are daunted by Shakespeare – the archaic Elizabethan language, the blank verse, the time-bound witticisms, Biblical and classical references, and endless metaphors. For those who love Shakespeare, these are the very reasons we read and watch his plays over and over again. I remember when I returned to Shakespeare many years after my university studies, I was amazed to rediscover that each and every one of his 37 plays was different. They were all Shakespeare, alright, but the diversity, ingenuity, and unimaginable range of his work was still stunning and amazing. The same playwright who wrote Hamlet wrote the fanciful Tempest and Midsummer Night’s Dream. The same man who wrote the governance plays – Troilus and Cressida, Measure for Measure, and Coriolanus – wrote grand guignol (Titus Andronicus) and patriotic history (Henry V). Despite his diffidence and cynicism about love, family, and human relationships displayed in the Comedies; he wrote lyrical poetry to his lover in the Sonnets and found one moment to write his only love play, Romeo and Juliet. His insights into human nature are penetrating and universal, and he was far ahead of his time in understanding the psychological dimensions of tragedy. What if not psychological anxiety is behind Hamlet or Lady Macbeth? He understood sexual dynamics and presented strong, intelligent and often manipulative women, achieving their goals within the circumscription of Elizabethan society. He was ahead of his time creating feminist women. Margaret of Anjou, queen of the weak King Henry VI, lead English troops in battle to fight the French and regain English territories. Tamora, Queen of the Amazons is a Nietzschean ideal, rejecting the bounds of traditional morality and exerting her absolute will. Shakespeare appreciated women for their wit, charm, and above all ability to dance rings around more myopic and unimaginative men. Shakespeare’s soliloquies illuminate interior character and conflict but also stand alone as great poems – metaphorical tours de force that are recited again and again. His burlesque characters are unforgettable and transcend time and era. Falstaff is perhaps the best example, but his clowns and fools who appear in many plays are often the wisest of all characters. His parodies of male ego and pride (e.g. Malvolio) are priceless; but he deals seriously with these faults in Antony and Cleopatra and Julius Caesar. There is no doubt that reading Shakespeare takes patience and attention. Even after many readings I always find some new nuance or subtle meaning I had overlooked. His language is so rich that one cannot ignore even a single line. I often read a passage many times, parsing the complex Elizabethan verse and Shakespeare’s allusive metaphors to be sure to understand his meaning. The Comedies are ingenious plays of disguises within disguises, men dressed as women playing men, and so much gender-bending and cross-dressing that I repeatedly check the List of Characters. It doesn’t come as a surprise then, that a new BBC Four documentary reveals how daunted many actors are by the Bard. Michael Gambon says he’s frightened of him. Christopher Eccleston and Zoë Wanamaker admit to not understanding iambic pentameter. All of us who’ve ever got a bit lost during a Shakespeare play can now breathe a secret sigh of relief – thank God, even the ones up on stage can get confused. 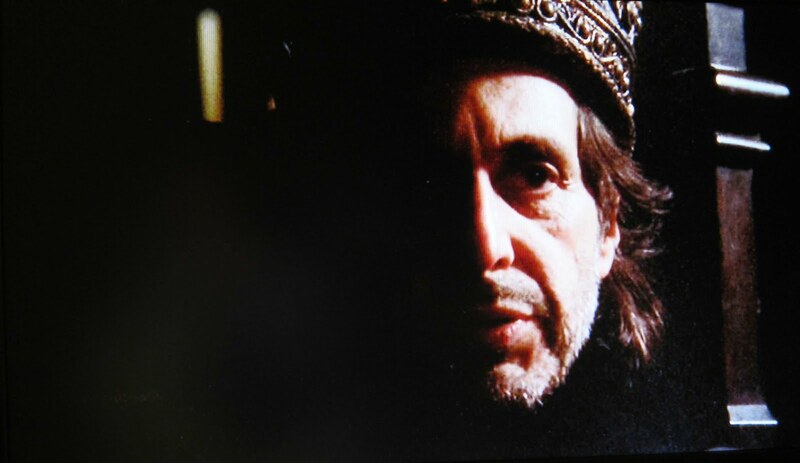 Al Pacino produced and directed Looking for Richard, a movie about American actors trying to find their own voices when playing in Richard III. He dealt directly with Bard-fear, and the lack of confidence that American actors have when approaching Shakespeare. They feel that they can never understand him like the British, can never master the poetry and the language like them. Shakespeare is in the souls of Gielgud and Olivier and English history in their bones. Pacino interviewed great British Shakespearean actors, all of whom told him to relax. Shakespeare’s themes were universal, and Americans were no strangers to the jealousy, greed, and ambition that he wrote about. Pacino was a great Richard, and his Shylock is perhaps the best interpretation of the character I have ever seen. Pacino understood the character, sympathized with him, added American Jewishness without caricature. He gave Shylock a dignity and authority that many other actors ignore. One of the most interesting presentations I have seen in a long while was by an acting coach at the Oregon Shakespeare Festival. He demonstrated how the principles of Stanislavsky can be applied to Shakespeare – that is, how to train actors to listen to the playwright’s words but to find their own voices in expressing them. He told them how to parse and divide verses, find the key words and meaning, and relate them to their own experience. The coach deconstructed complex language for the actors, enabling them to understand what Shakespeare was trying to say. Nicholas Hytner, the outgoing artistic director of the National Theatre, got it right when he said Shakespeare should be acted in spontaneous, comprehensible, natural speech patterns, “not over-coloring, not going for the overt, musical, poeticized” approach that was popular 40 years ago, ie the Laurence Olivier versions. Good actors underplay Shakespeare: they let the brilliance of the writing do the talking, and don’t let too much “odds bodkins”, Ye Olde Englande stuff get in the way. I do not agree with Mount and his sources who say that Olivier was a bad film interpreter of Shakespeare. His Richard III was creepy; his Hamlet rightly focused on the incestuous relation between Hamlet and his mother, and the ‘closet scene’ was genius. Nevertheless, the point about overacting is well-taken. Richard Burton’s Hamlet is a good example. Rather than become Hamlet to convey the Dane’s indecision, frustrations, and psychological debility, Burton declaims the words. He bellows them, is orotund in his delivery. He is acting, if not overacting; and certainly mis-acting. I have also seen some horrible modern versions of Shakespeare where directors, in their desire to make his plays more ‘accessible’, turn actors into buffoons. I once saw a Hamlet give his ‘To be or not to be’ soliloquy as a young modern punk. “Hey, dude…To be or not to be…Now, that is the question”, said with a pimp-walk and a strut. What was the director thinking? I have seen Shylock played as a ridiculous caricature of a Jew set in the Lower East Side of New York; Othello as a macho black man instead of the insecure, doubting, vulnerable, and jealousy-crazed man that Shakespeare intended. At the same time Ian McKellen’s Richard III – the play set in modern, Nazi-like era – is absolutely brilliant. Everything from his painfully crippled hunch, to his sniveling, yellow-fingered smoking, to his perverse seduction of Anne is in character; and as we see him murder and plot his way to power, the staging, costumes, and set design become more and more Nazi. The transition is perfect and meaningful. McKellen knew exactly what Richard was all about because he knew that the character was universal. Peter Brook’s King Lear is certainly the best production of the play of any time. Set in the far north of Danish Jutland, Brook recreates the pre-history of the action. It is cold, harsh, and unforgiving. It is the perfect backdrop for the evil sisters and the credulous but insane king. Brook knew that he did not have to produce the play as it had been played before, and used location and atmosphere to perfect advantage. The point is discovering meaning. Proceeding carefully and patiently and discovering for yourself – actor or reader – what Shakespeare means for you. Real life collided neatly with the lines. And that’s the effect confused Shakespearean actors should aim for – avoid the theatrical and keep it real.